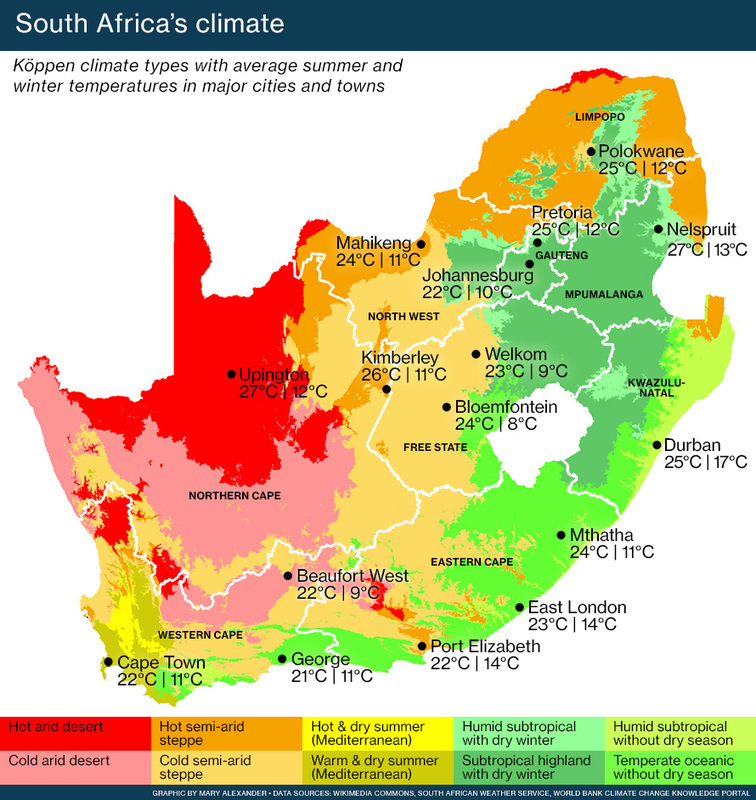 South Africa’s long coastline – some 2,800 kilometres – influences much of the climate. On the west coast is the cold Atlantic Ocean, and the warmer Indian Ocean on the south and east. 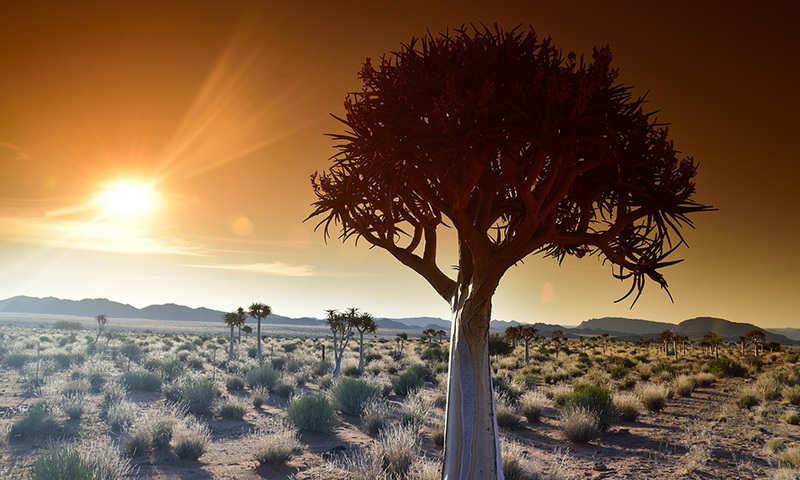 Starting at the hot and arid desert border with Namibia in the northwest, South Africa’s coastline runs south down the cold Skeleton Coast, around the Cape Peninsula to Cape Agulhas. This is the southernmost tip of Africa, said to be where the Atlantic and Indian oceans meet. In fact, it’s here, slightly offshore, that two coastal currents meet, currents that determine the different coastal climates. The cold Benguela current sweeps the west coast, and the warm Agulhas current the east. From Cape Agulhas the coastline moves east and slowly northwards, and the climate becomes warmer and wetter. The Western Cape’s pretty green Garden Route gives way to the forested Wild Coast in the Eastern Cape, and then humid subtropical KwaZulu-Natal coast, famous for its beaches. In the northeast, the coast reaches the border of Mozambique. Running along most of the coast is a narrow low-lying strip of land, which soon gives way to a higher plateau – the Great Escarpment. The high altitude of South Africa’s interior means the country is generally much cooler than southern hemisphere countries at the same latitude, such as Australia. South Africa is famous for its sunshine – an average of 2,500 hours of sun every year. It’s a dry country, classified as semi-arid. The average annual rainfall for the whole of South Africa is about 464 mm. The world average is about 860mm. Most of South Africa gets rain only in the summer. 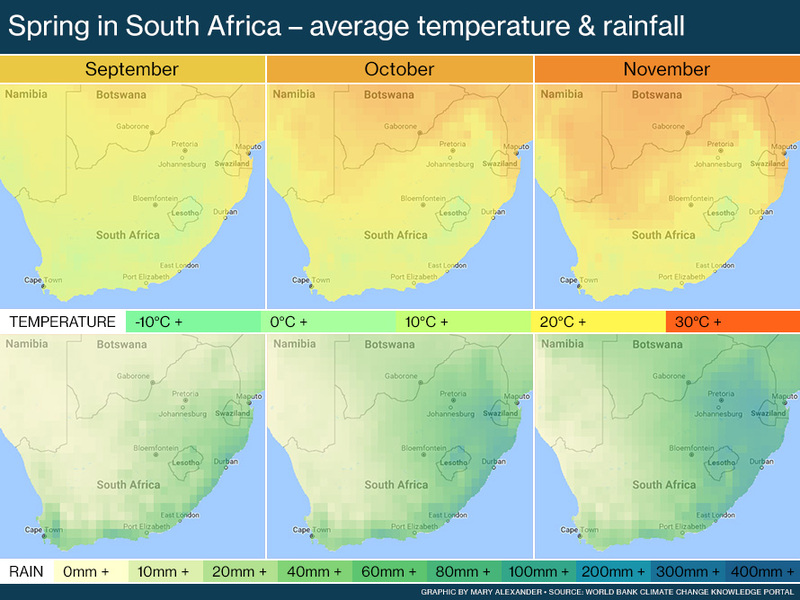 The region around the Cape Peninsula, including Cape Town, has a Mediterranean climate: cold and miserable rain in winter, balanced by glorious clear-sky summers. But Cape Town is most famous for its relentless year-round wind, which blows from either southeast or the northwest. 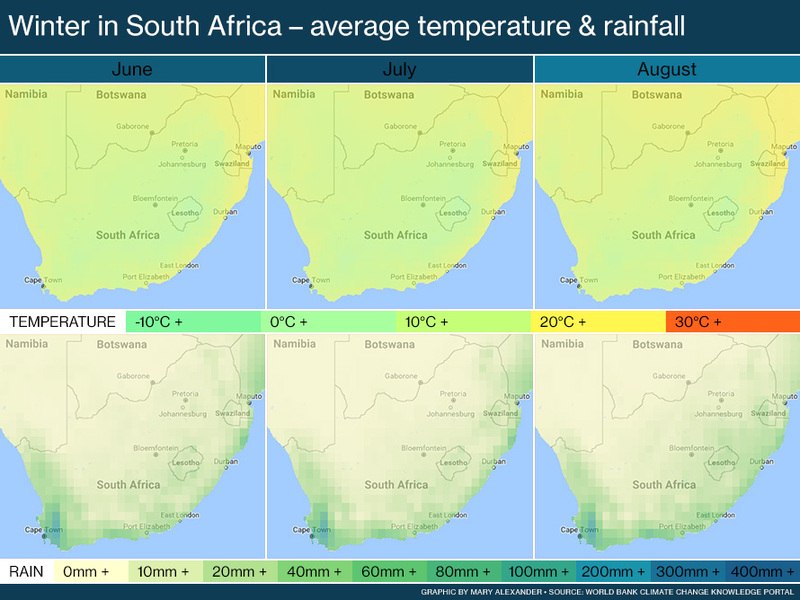 KwaZulu-Natal’s coast and areas of the Mpumalanga lowlands get warm rain all year. 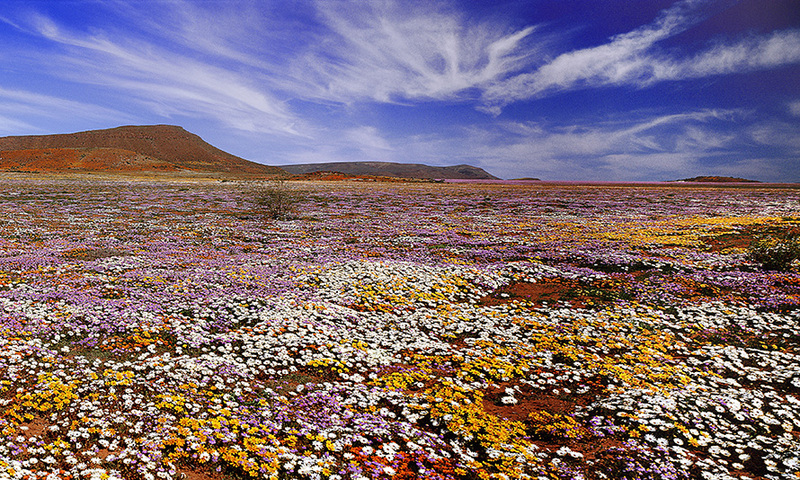 The great inland Karoo plateau, where rocky hills rise from scrubland, is dry, and gets drier in the northwest towards the Kalahari desert. It’s a region of extremes: very hot in summer and icy in winter. The eastern Karoo gives way to the flat landscape of the Free State, which gets a little more rain. 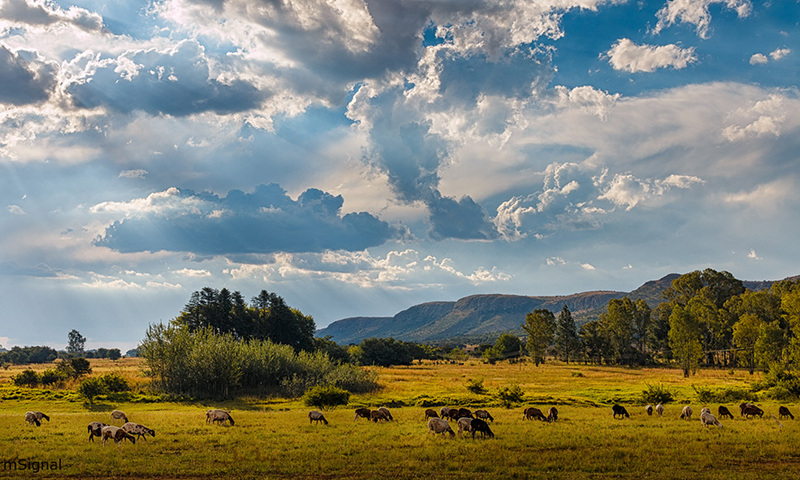 The highveld region north of the Vaal River is wetter, with milder weather and less extreme subtropical heat. 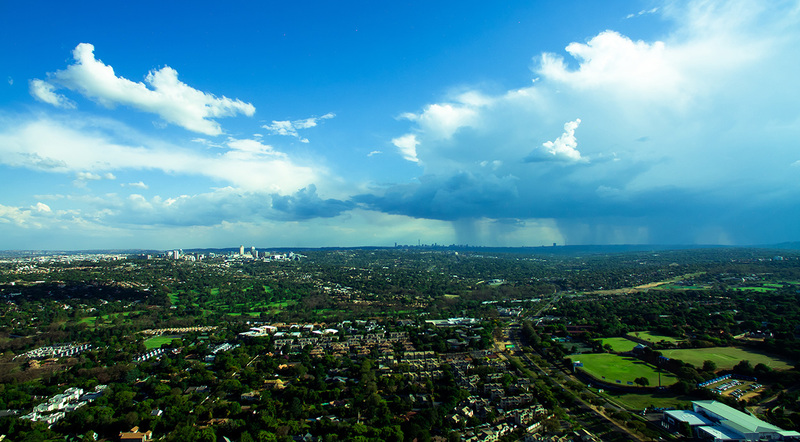 Johannesburg lies at 1,740 metres above sea level, and has an annual rainfall of 760 millimetres. Winters on the highveld are cold, but snow is rare. Further north and east the highveld drops down into the lowveld. Temperatures rise, and the land turns to typical bushveld, the habitat of South Africa’s wildlife. South Africa is the southern hemisphere, so midwinter is in the middle of the year and high summer in December and January. In spring South Africa warms up from the top down. It quickly gets very hot in the far north province of Limpopo, and the desert regions of the Northern Cape and North West. The southwest stays cold and wet well into spring, typical of its Mediterranean climate. The coast in the south and west gradually gets more rain, and humidity rises. In the rest of the country the weather gets pleasantly warm and sunny, before the summer rains begin. The rains, generally mid-afternoon thundershowers, start in about mid-October. Over much of South Africa, summer means warm, sunny weather – often with afternoon thunderstorms that clear quickly, leaving a warm and earthy smell in the air. The arid regions of the central Karoo and Northern Cape get very hot, with some relief in more rain. Northern Limpopo and KwaZulu-Natal are also often exhaustingly hot. 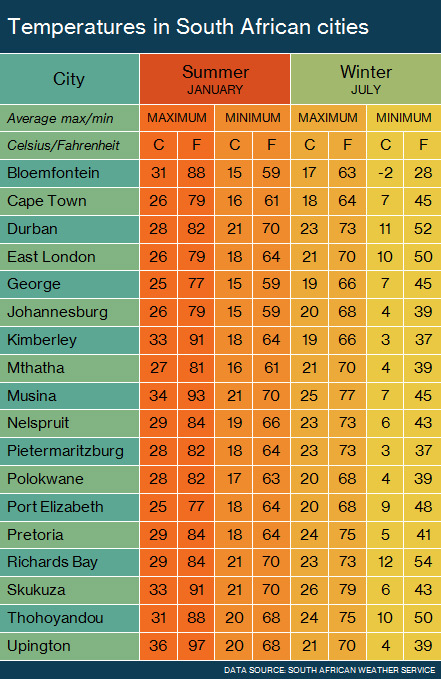 The Northern Cape – a province of weather extremes – gets the hottest weather, and the temperature records. In 1948 the mercury hit 51.7°C (125°F) in the Kalahari near the town of Upington. The high altitude of the interior plateau keeps average summer temperatures below 30°C, so summer is warm without being oppressive. 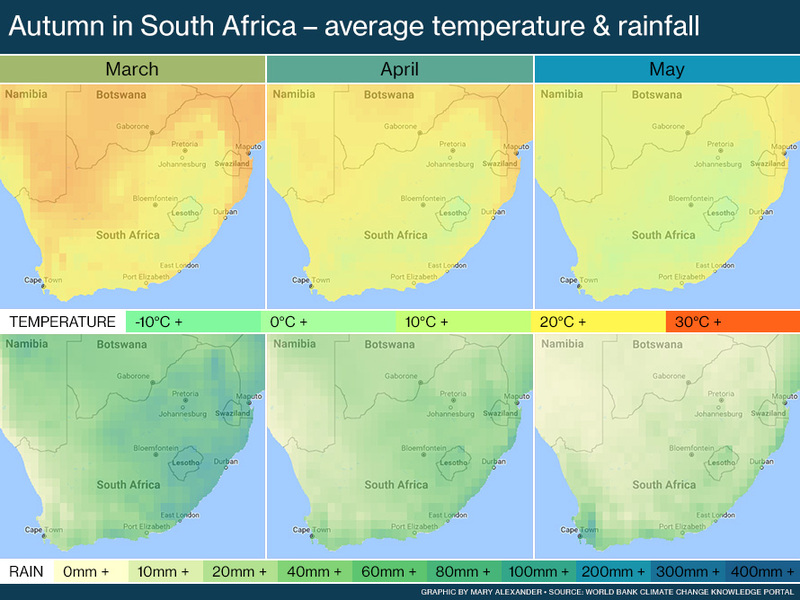 Summer is the season of rain in most of South Africa, changing much of the country from khaki to green. It’s mostly warm rain, delivered in short and drenching storms. The Cape Peninsula in the southwest is the exception, staying clear-skied and sunny all through summer. In autumn South Africa’s weather comes into its own. The days are still long and warm, getting chillier – but still brisk and sunny – in the early morning and evening. The rainy season comes to an end in autumn, leaving the skies clear and the sun shining. 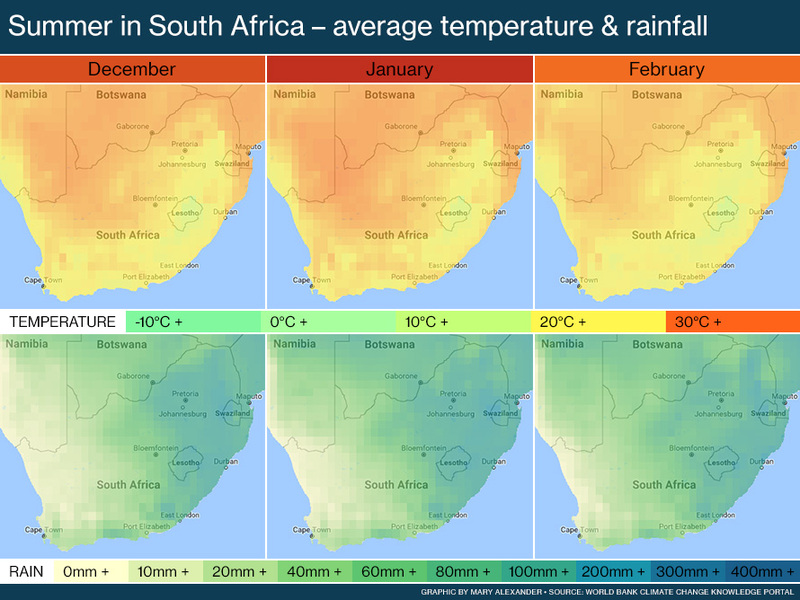 By May most of South Africa has settled into its dry season, which will last through winter and well into spring. 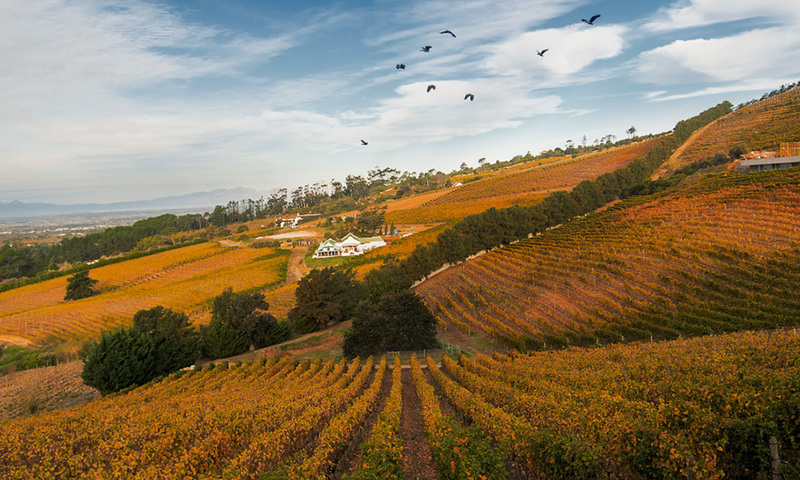 Autumn comes at the end of the dry season on the Cape Peninsula, thanks to the region’s Mediterranean climate. Here the autumn weather is beautiful, with hot sunny days and warm, balmy nights. It’s only in May, a month from winter, that the rains begin again. South Africa’s winter is mostly pleasant sunny weather with cloudless blue skies, punctuated now and then by a few days of cold fronts. In the high interior plateau winter days are dry and sunny, with clear skies and crisp air. The nights are chilly. Temperatures only drop to freezing when a cold front sweeps in. Cold fronts mean heavy snow on the mountains of the Western Cape and Northern Cape, and on the KwaZulu-Natal Drakensberg. When it snows on the mountains, icy weather quickly spreads to the rest of the country. 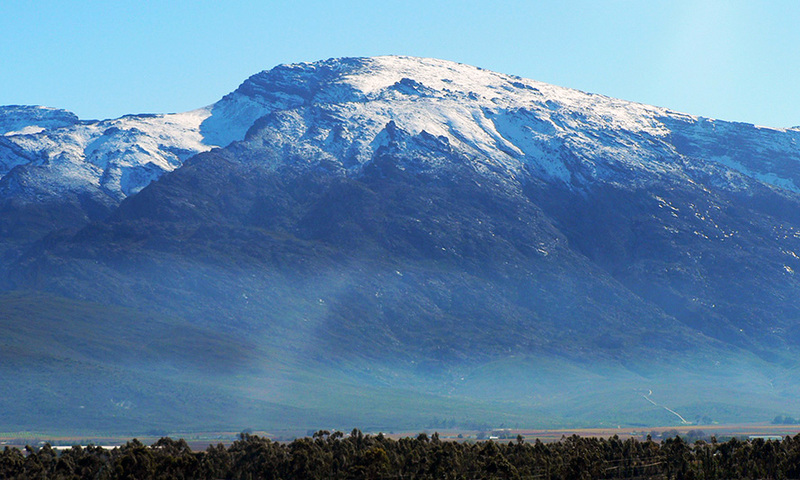 The coldest place in South Africa is the Northern Cape town of Sutherland, in the western Roggeveld Mountains. Here midwinter temperatures can drop to -15°C (5°F). The Western Cape gets all of its rain in winter. The winter weather in Cape Town is always cold, wet and unpleasantly windy. By contrast, the hot, humid KwaZulu-Natal coast, and the lowveld of Mpumalanga and Limpopo provinces, offer lovely winter weather with still, sunny and warm days.